One smooth and cool looking mid-sized table tennis table. Less playing space required compared to a regulation sized table, but still offers the fun, excitement and competitiveness of full sized table tennis. Table size of 72-inch long x 36-inch wide x 36-inch tall, and features a 1/2-inch thick MDF melamine table top with a cool black finish. Sturdy steel frame and legs and attachable net with black mesh and white tape. When not in use, the concept 81 folds in half for storage (41-inch long x 36-inch wide). Also includes (2) basic wood paddles and (2) table tennis balls. 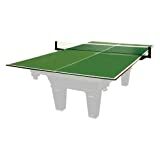 Time to get your game going with the concept 81 mid-sized table tennis table from park and sun sports. 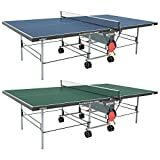 The Prince 2-Piece Conversion Table Tennis Top is a perfect addition to any billiard table. It quickly converts a billiard table into a table tennis table. The 5/8” Green top is the same play surface on some of Prince’s most popular table tennis tables. Fits 7’ or 8’ pool tables. Net and post sold separately.